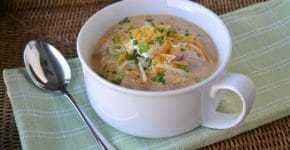 I started making this recipe as a dip with chips for party buffets for football games. Then one summer evening when I didn’t want to cook because of the heat, I made it and served it on a bed of lettuce with cantaloupe slices. 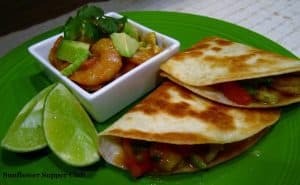 Another time I didn’t seem to know what to fix for dinner and it was getting late, so I fixed the recipe and made quesadillas with it. I think you are getting the picture! It is a great recipe to tinker with – add a little of your own flair, take something out you don’t particularly care for, or add some fun item in. I’m flexible that way – life is too short to stick with the rules! Give it a try sometime when you want something quick and easy . . . and yummy! I always love to find a recipe that can be used many ways — it just makes life easier, if you know what I mean. It’s a little like the old woodworking saying: measure twice – cut once. Since I don’t do any woodworking, I adopted it for us foodies and it reads like this: prepare once – make several dishes! Rinse and peel shrimp. Drain well and then pat dry. Add chopped avocados, tomatoes, green onions and cilantro. Stir gently to combine. In another bowl combine lime juice, lime zest, jalapeno juice, chopped jalapeños, salt, cocktail sauce, and ketchup. Stir until combined. Add sauce to shrimp mixture and gently stir to combine. Refrigerate and let sit to combine for 4 – 6 hours. Of course, if you would like to ramp up the heat, just increase the jalapeños to your desired preference. Before serving, drain any watery liquid that may have accumulated. Add a little fresh chopped cilantro and green onion to the top for garnish. Enjoy with chips or any other way you may prefer!